Why Should You Maintain a Proper Sleep Cycle? As you are consumed between hectic routines and daunting tasks, three to four hours of snooze a day seems a pretty cool getaway, isn't it? But in order to lead a healthy life, it isn't enough. Your tired body demands a proper sleep cycle to recharge itself and prepare for another challenging day ahead. Now through this line, you are intriguing the reader to go forward with the article. Getting proper sleep contributes a lot to your healthy life. Proper sleep has numerous benefits of reducing stress, improving health, enhancing memory, preparing you for the next day and much more! Sleep expert Mark Wu conducted a research at John Hopkins on sleep cycle importance. He found that a healthy amount of sleep is essential to improve understanding and comprehension skills. On the other hand, inadequate sleep leads to a decline in learning and memory processes and you often face difficulty in remembering details. Therefore, improper sleep cycle leads to sleep deprivation or lack of sleep. Long-term sleep deprivation affects your overall productivity and leads to memory loss, difficulty in concentration on behavioral issues. For better understanding of its importance and how can you improve it by using different tips, first let's learn about sleep cycle! When you are asleep, your body goes through multiple stages or phases, commonly known as NREM and REM. Throughout the snooze time, your brain switches between these two stages. A complete sleep cycle comprises both NREM/REM. Therefore, it is also known as sleep-dream cycle and REM-NREM cycle. Most part of sleep cycle is consumed by NREM sleep with the first four stages and last stage of REM sleep. An average sleep cycle lasts about one to two hours and occurs three to four times per sleep. Different brain activities take place during the sleep cycle that improves your physical and mental health. However, at times, your individual way of life and lifestyle can alter your natural sleep cycle. The use of drugs, chronic sleep disorders, bad mattress, or medical conditions etc., might keep you awake at night, and as a result disrupt your overall slumber schedule. Therefore, it is important you are aware of how you are sleeping every night and be aware of the factors that are negatively influencing night time rest. Sleep cycle has three types. It is important to understand which sleep cycle type you fit in so you can make more informed decisions about how you sleep and work on improving it with a mindful approach. Let's learn more about them. Interestingly, according to Dr. Michele Neil-Sherwood of Functional Medicine Institute, the numbers of hours you snooze is not really what makes you refreshed. On the contrary, the sleep cycles you complete per day is more important. Hence, it is vital you know which type of NREM-REM schedule you have and whether or not it is suitable for your health. The sleep cycle is of three types — the significant difference being the variations in the hours of sleep you have routinely. The sleep cycle your body is accustomed to depends on your lifestyle and habits. For example, if you are a business owner, you might not have time to enjoy continuous sleep and fulfill the required slumber quota through frequent naps. On the other hand, a person with a 9 to 5 schedule can sleep at fixed times every night. To achieve a good night's sleep, it is essential for your body to complete these five stages of the sleep cycle. In this blog, we will be focusing on monophasic sleep cycle as most of the people follow this schedule. In order to fully understand what is a good sleep cycle and which schedule you should follow, you need to know the different types of sleep too. Following is a short overview of sleep types. Every NREM-REM cycle comprises of several phases ranging from light sleep to deep sleep. It is crucial to know about them so you can be mindful of how you are resting every night. NREM includes the first four stages of the cycle. It takes about 70 to 80% of the sleep cycle, covering majority part of the night. NREM is also known as dreamless sleep as you are not yet deep in slumber or dreaming. The brain waves during this time are relatively slow, along with the heart rate and blood pressure. In addition, the muscle activity is limited but you may occasionally twitch depending on the stage. This type of sleep lasts for about 70 to 90 minutes and consumes approximately 25% of the overall cycle. REM is the deep sleep phase and the time when you venture off to the dreaming stage. At this point, your eyes move rapidly even with closed lids, the body temperature drops, heartbeat increases and the muscles stop moving. Your body needs to undergo deep sleep in order to reboot, improve cognitive functions, reduce risk of neurodegenerative disorders (such as Parkinson's or Alzheimer's), and develop brain functions. NREM/REM is different among adults and babies due to varying physiology and sleep requirements. Let's see how sleep cycle varies with age. Does Sleep Cycle Vary with Age? Yes, your sleep cycle varies as you start aging. From infancy to elderly years, as your body experience changes, the number of hours you snooze, sleep-wake time, NREM/REM quality, and the time it takes you to fall asleep also changes. Bliwise, in the book Normal aging, in Principles and Practice of Sleep Medicine, states aging naturally declines the slumber quality and quantity in humans even if one has no significant sleep disorders. So as you grow older, you'll notice lack of deep sleep, frequent interruptions during rest, and inability to continue snoozing for solid eight hours at night. For instance, infants commonly sleep for more than 12 hours a day (even though the slumber may be interrupted). On the other hand, as the kids grow and reach adulthood, they will need at least seven to eight hours of sleep per night. The sleep cycle among elderly is slightly different. Even though they need the proper eight hour NREM/REM cycle, due to continuous interruptions, the older folks get a somewhat fragmented sleep at night. As a result they wake up tired and are still in need of rest, which they later on cover with daytime naps. This table better explains how the sleep cycle varies with age. Presence of sleep disorders and various medical ailments also affect the cycle duration. For example, some older people take medications to treat existing diseases which may lead to less sleep at night. Other times, frequent urination urges often decrease the time of rest. Conclusively, regardless of the sleep disorders, healthy elderly people spend most part of the night drifting on and off to sleep because of the age factor. On the other hand, young adults and babies enjoy a much better deep slumber. Now that we've covered the basics of sleep cycle, it's time to dig into the sleep stages. But first, let's take a quick look at how the brain communicates while you're asleep. During the night, as you drift from one sleep stage to another, different brain waves are produced. Let's take a look at them. As you know, the human brain consists of small cells or neurons that communicate with each other or send signals in the form of electrical impulses. When neurons in the brain work together, they create brain waves. The changes in the amplitude (height) and frequency (number of waves per second) gives rise to different types of brain waves. The most commonly occurring brain waves are delta, theta, and alpha. These waves are extremely important part of a sleep cycle. Their production assists experts in understanding how well you are sleeping every night. Slight differences in their amplitude or frequency is a warning sign of an underlying disorder or sleep-related issue. Adult monophasic sleep cycle comprises of five stages that are repeated over a span of an eight hour resting period. Here's how long is a sleep cycle and what happens at each stage. Stage 1 is typically a phase between falling asleep and wakefulness. At this stage, you experience light sleep. For instance, when you are laying on the bed with closed eyes, while slowly drifting off to sleep – this experience reflects Stage 1. During Stage 1, the body moves often while changing positions. Your mind and body are incredibly relaxed at this time. As you are not fully asleep, the eyes are still fluttering open but the muscle movement is minimum. Both alpha and theta waves are produced. During early Stage 1, alpha waves contain low frequency but high amplitude, which later on turns to theta with lower frequency and high amplitude. At Stage 2 you're still enjoying light rest and complete relaxation. The eye movement slows down as your mind and muscles start to relax. Also the heart rate and overall body temperature drops. This phase is defined as the actual beginning of NREM when you are not fully awake and the body is preparing itself to fall asleep. Thus, any action or activity will not disrupt your sleep. If you wake up during this stage of the sleep cycle, it is considered a power nap. In stage two of the sleep cycle, brain waves slow down relatively. 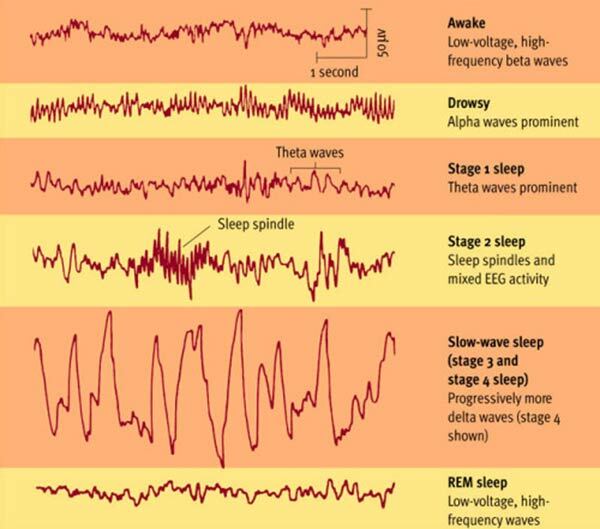 The theta waves are combined by the sudden brain frequencies, known as sleep spindles, occurring specifically at Stage 2. Stage 3 and 4 also goes by as "deep NREM sleep" because now you have finally fallen asleep although still not deeply resting. However, various sleep disorders such as parasomnias (sleepwalking or talking, sleep paralysis, etc.) may occur at this phase of sleep cycle. At this point, there is zero muscle activity or eye movement, and your mind is completely relaxed. The blood pressure and heart rate also falls dramatically. Any external action occurring during this stage — for instance, someone calling your name or touching you — won't wake you up. All in all, the human mind is pretty unresponsive to external stimulus. If you are suddenly woken up during this time of sleep cycle, you will feel groggy and it will take time for your brain to get accustomed to the surroundings. At Stage 3 & 4, while your mind travels to a much deeper level of the sleep cycle, the brain produces delta waves, consisting of low frequency and high amplitude. These brain waves are produced at a slow pace. REM is the final phase of a sleep cycle. Your body enters Stage 5 after 90 minutes of falling asleep and is repeated over the entire length of the night. For instance, if you are sleeping for seven to eight hours, REM occurs around four to five times. Stage 5 is also known as the dream state of the sleep cycle, as most of the people start dreaming at this point. The eye muscles are extremely active (as they follow visual images in your mind) and thus, their movement is rapid. As soon as you hit REM, the heartbeat and blood pressure increases rapidly. Ironically, it is much easier to wake up during deep sleep because the body muscles are active. At Stage 5, the brain wave activity becomes extremely active. Interestingly, your fast brain wave activity also connects your mind to visuals while you are dreaming. The brain produces low amplitude but high frequency waves, which are pretty much similar those in the wakefulness state. Sleep cycle of babies is slightly different from adults. Let's take a look at the variations. Babies enjoy sleep for straight 12 to 14 hours - which is way too much than adults, right? But they also have a disturbed and interrupted cycle. Following are some of the ways babies' sleep cycle differs from adults. Babies take much longer to fall asleep: Infants stays much longer in the lighter state of sleep or wakefulness period. Hence, any activity or sound can easily wake them up. Babies experience more REM sleep than adults: Little ones usually sleep for 15-18 hours per day and their REM phase stays for less than an hour. As a result, they experience more REM sleep than adults. Babies take longer to shift towards next cycle: This one is a no-brainer! Once infants wake up from the initial phase of rest, they require a lot of effort to fall back to sleep. At this point, one might wonder what goes on inside the human brain during sleep cycle? Let's put your curiosity to ease! Sleep cycle anatomy refers to the structures of brain that are active while you are asleep. Here's an overview of the brain areas active during NREM/REM. Hypothalamus is responsible for maintaining a proper circadian rhythm by receiving signals from eyes when exposed to light. In blind people, hypothalamus may not work effectively when it comes to sleep cycle. This region is involved with a stabilized switch between falling asleep and waking up. It not only encourages REM sleep, but also ensures we don't act out our dreams while snoozing. Glands are associated with the production of hormones. Pineal gland promotes the production of melatonin or the sleep inducing hormone. The former helps with both wakefulness and deep sleep experiences. However, midbrain is more active when it comes to arousal. Thalamus is active during REM stage as it provides information to initiate dreams. Amygdala controls the emotions during the dream phase. From the time of dusk to dawn, your body occasionally releases chemicals that inform your brain when to get ready for sleep or to wake up. On the whole, 10 neurotransmitters are involved in putting your brain to sleep or inducing arousal. GABA ensures muscle relaxation and limits wakefulness activity while sleeping. Melatonin controls the circadian rhythm. At the time of sleep, the level of melatonin is quite high. Adenosine starts producing when you are awake and slowly takes you toward sleep phase by decreasing neurons (brain cells) activity. Histamine is associated with wakefulness. Its production during REM is low. Acetylcholine, on the one hand promotes wakefulness. But at the same time, it is actively produced during REM sleep or deep slumber phase as well. Norepinephrine is yet another arousal neurotransmitter that encourages attentiveness and prepares your body for performing tasks. Dopamine also causes arousal and is associated with many cognitive functions including memory and learning. Serotonin promotes wakefulness characteristics and regulates mood. Low levels of serotonin in the body can lead to depression and anxiety. A healthy body keeps your sleep-wake cycle regulated. However, at times, lifestyle choices and routine stresses can throw off the balance, causing difficulty in falling or staying asleep. In short, it messes up the circadian rhythm. Let's see what circadian rhythm is and how it is related to NREM/REM cycle. Circadian rhythm is your body's internal clock, responsible for sleep cycles, wakefulness and cognition – often called sleep-wake cycle. All your behavioral, physical, and mental processes are governed by the body clock. In fact, it is the circadian rhythm that tells you when to eat, go to washroom, fall asleep and wake up! Through a proper circadian rhythm, your body schedules a certain time for you to slumber every night. Hence, it is useful in setting a sleep pattern. At the time set by your body's internal clock, the brain starts releasing melatonin or the sleep hormone, triggering you to go to bed. People who work in night shifts or travel often in different time zones have disrupted internal clocks. As a result, the body's internal clock resets in each zone but it might take a few days to adjust. Scientists nowadays are focusing their research on how the blue light from electronic devices (mobiles, laptops etc.) alters circadian rhythm. Findings from this study could have groundbreaking impact on screen-time before bed! Improper circadian rhythm can have dire effects on your overall health. Irregular sleep-wake cycle causes sleep disorders, heart problems, increases or decreases weight, hinders metabolism, and leads to mental health issues such as anxiety, depression and even bipolar disorder! Irregular or interrupted sleep cycle can pose major consequences on your health. Following are just a few ways you might suffer in the absence of a proper resting schedule and how does sleep cycle determine sleep quality. The sleep cycle is directly related to your cardiovascular system. Any disruptions in sleeping patterns lead to cardiovascular problems. Lack of sleep in a proper cycle may enhance your chances of heart diseases and strokes, as the activity of brain structure controlling it, slows down. If you continuously ignore adhering to a timely cycle, you might be prone to developing sleep disorders - which can even turn chronic if not treated! Many people nowadays suffer from sleep disorders such as insomnia, sleep apnea, narcolepsy that causes dysfunction and lead to irregular sleep cycle. For example, a person with a normal sleep cycle enters into REM sleep 90 minutes after falling asleep. However people suffering from narcolepsy rapidly enter into REM sleep, which leads to irregular sleep cycle. As sleep disorders and sleep cycle are interrelated, keep in check whether you're getting enough NREM/REM rest or not as its lack may result in development of lasting sleep disorders. In the fast-paced world and tedious routines, people often tend to ignore a full night's sleep, which leads to improper sleep cycle and sleep deprivation. When you wake up early after an inadequate sleep, your body is unable to complete simple neurological processes such as memorizing or learning. In a state of a broken sleep cycle, the memory retention is disrupted affecting your overall productivity. Hence, the cognitive performance skills allowing you to smoothly accomplish daily tasks depend greatly on your how you manage your sleep cycle. Ensure you sleep for adequate hours, as it's directly proportional to high productivity and prosperous life. A healthy lifestyle highly depends on a regular sleep cycle. Untimely exposure to lights or unhealthy habits can break the circadian rhythm which in turn, affects sleep cycle. For example, people who drink coffee or consume alcohol before bedtime can experience frequent sleep-wake cycle disruptions in their life. They are unable to stick to a fixed resting and waking time because of which, they can later on develop sleep disorders as well (such as insomnia!). It is also worth considering that while unhealthy bedtime rituals can disturb the sleep cycle, at the same time lack of NREM/REM sleep can further promote a disturbed lifestyle. Such people might find themselves easily irritated or relying on drugs to adhere to a normal sleep-wake cycle. Mental illness is one of the most significant factors resulting from improper sleep cycle. According to a research conducted in 2015, disrupted sleep cycle is a primary cause that leads to depression and anxiety. Improper sleep cycle impacts daily psychosocial functioning in both adults and infants. You might face difficulty in interacting with others with constant feelings of loneliness and depression. Factors of mental illness and social anxiety may lead to a decline in academic performance, loss of relationships, and lack of focus. As you can see, not following a proper sleep schedule may lead to poor rest quality and pose long- and short-term health consequences. But don't worry! We also have a number of useful techniques to help improve an interrupted sleep cycle. How to Improve Broken Sleep Cycle? The following practices will surely help you to get back on track and how to reset your sleep cycle. To reduce interruptions while resting, the first step is to select a cycle type that you can easily follow every day. One of the most optimal and widely incorporated sleep cycle type is monophasic (snoozing for a solid seven to eight hours per night). However, for some individuals, biphasic (two sleep episodes per day) sleep works best, while others with a much busy schedule are comfortable with polyphasic (multiple naps during the day). Hence, choose a sleep cycle type that works best for you and something you can stick to without issues. Not sleeping on a comfortable bed can lead to numerous health issues. The top one among them is disruption of sleep cycle. If you don't rest on a suitable, supportive mattress at night, you'll wake up often or toss and turn, causing sleep disturbance not only to you but also to your partner. Hence, health professionals advise to buy the best mattress for your body promoting uninterrupted snooze. One of the main problems that eventually lead to messed up sleep cycles is the inability to get timely exposure to sunlight. Specially the people who frequently have duties after dark or are awake during the night but asleep during the day. When your body is not in the habit of getting sunlight on time, it messes up the chemical release process. Hence, sometimes, the sleep hormones are produced during the day and sometimes after dark. In short, there is no fixed hormone release time. According to sleep experts, you should get in the habit of getting out in the sun in daytime by going for a walk or exercising every morning for at least 15 to 30 minutes. This practice will help regulate the sleep cycle and also give you a Vitamin D boost. Varying sleep schedule can mess up your circadian rhythm and cycle. If you go to bed at a different time every night or wake up at a separate time each morning, your body won't be accustomed to a proper sleep-wake cycle. Because of this variation, the brain has no fixed time when to release the sleep hormones or induce wakefulness. You'll start feeling tired at odd times which will decrease your productivity. Experts encourage people to maintain bedtime rituals that promote sleepiness to avoid messing the schedule. For example, meditation, listening to relaxing music, or a hot bath before going to sleep. Your bedtime eating habits can seriously mess up the sleep cycle if you're not mindful of what and when you're snacking. Whenever you eat a snack or take a meal before going to rest, it starts getting digested. Because of this, you may get bloating or the urge to go to the loo in the middle of the night. In addition, spicy foods often promote acid reflux which can ultimately break your sleep cycle. Thus, it is best to not consume any meals at least three hours before bed to enjoy a comfortable, undisturbed snooze. If you travel frequently because of business or pleasure from country to country, dealing with jet lag could be really challenging! Due to the differences in time-zone, the circadian rhythm might get disturbed as your body won't produce sleep hormones at the time it normally does. And as a result, the sleep-wake cycle might need readjustment. It's hard to avoid jet lag but fortunately, you can adopt certain practices to keep your cycle on track. For example, before taking a trip, you can plan the sleep schedule ahead of time. Estimate how your time periods will differ and shift your routine accordingly. You might be more comfortable with a polyphasic sleep cycle by taking multiple naps during the day to get the required hours of sleep. When nothing works, you can try white noise apps to sleep during the journey and not mess the cycle at all! If you are busy catching your zzz's for too long during the day, your sleep cycle will get disturbed, and eventually, you'll find yourself unable to rest at night. Taking long naps during the daytime can be specially bad for maintaining a proper sleep hygiene. Regardless of how busy your schedules are, you can't ignore the importance of having a good night's sleep without interruptions. Continuously failing to adhere to a snooze timeline can create havoc on your physical and mental health, leading to the development of chronic sleep disorders. Hence, it is best to take your resting hours seriously, get the adequate amount of sleep at appropriate times, and avoid disturbing your sleep cycle.